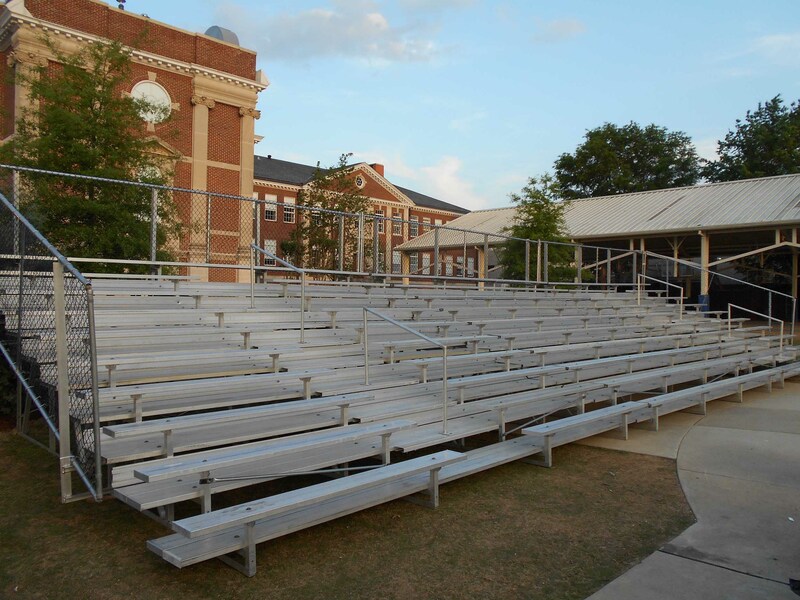 We offer new bleacher sales, and are able to provide the materials, or we can assemble them on site. In addition to our new bleacher offering, each year we build new aluminum bleachers for our Florida rental bleacher inventory and in some cases the materials do not make it back into the warehouse for a number of reasons. Most of the time we simply do not have enough room to store them and when that happens we sell a few sections of our quality alumiunum angle frame bleachers to our clients for prices that you just can not get a new set of bleachers. Below is a list of the current used bleachers for sale from Florida Bleacher Rentals and some information about our new bleachers. More used bleachers may be available, so please contact us for a custom quote or to check our inventory. Purchase price for 21’ long 5row used aluminum bleacher starts at $4,050.00 per unit Price does not include delivery or installation. Please contact us for a delivery or installation quote Currently we have 5 sections of these units available for sale. They can be installed in individual sections of 21′ long or in longer sections depending on client needs. 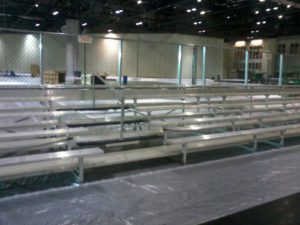 Florida Bleacher Rentals also sells new aluminum angle frame bleachers in multiple sizes and designs. Some of our standard sizes are as follows, but we can design, manufacture, deliver and install almost any size or style of angle frame bleachers. Elevated aluminum bleachers come in multiple sizes from 21′ long to 300′ long and can range in rows from 6 rows high to 21 rows high depending on seating needs and site dimensions. All elevated units come with ramps and stairs as needed for ADA compliant bleachers. Because we not only rent but manufacture bleachers we use a large amount of alumimum products and our prices are very competetive. Call Florida Bleacher Rentals with any questions or for a free no obligation estimate for your bleacher needs.